clipasian: Economic crisis in Cambodia, from the World Bank's point of view: with bad luck comes some good? 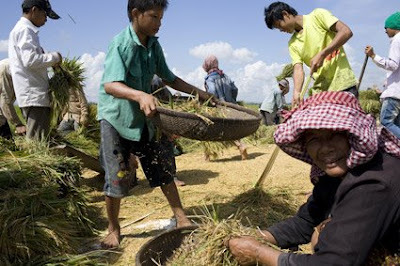 Economic crisis in Cambodia, from the World Bank's point of view: with bad luck comes some good? East Asia will not be spared the impacts of the global economic storm which started in the developed countries and has been severely raging throughout the world since September 15th, the World Bank (WB) warned in its latest report, released on Wednesday December 10th. However, according to projections made by Jim Adams, vice-president of the World Bank, the region of East Asia and Pacific, pulled by China's line of dynamism and better-prepared to face the crisis than it was in 1997 when it was hit by the financial slump, will contribute about a third of the total global growth in 2008. But what about the small Kingdom of Cambodia, who stood out over the past ten years with important growth records - GDP growth averaged 11.1% between 2004 and 2007 - achieved thanks to open policies? The WB forecast a GDP of 6.7% for 2008 for the country, but the product should plummet down to 4.9% for 2009. “The unfavourable external environment will now lead to less demand for Cambodian exports, fewer tourists, and less foreign investment”, Stéphane Guimbert, a senior economist for the Cambodian branch of the World Bank, explained. “Inflows of foreign direct investment are projected to slow from a record high of 10% of GDP in 2007 to 5.2% in 2009, as foreign investors become more cautious about investing in developing countries, in a context of unstable economic situation. So, the four key drivers of Cambodia's economic growth will suffer severe blows: first of all, the sector of agriculture: it offers substantial opportunities for Cambodia, a rice exporter, but the scope for a robust supply response remains uncertain given the recent decline in prices and limited investment in the sector. Then, the garment industry, hit by the slowdown in the United States, its main export market, weakened by competitiveness issues due to high inflation and an increase in workers' wages, and affected by the lifting in 2009 of safeguards measures by the United States and the European Union on China, a major competitor in garment exports. Thirdly, the sector of construction is slowing down too, due to the consequences of the crisis on Korea who had until now been acting as a locomotive for the Cambodian construction sector. Finally, tourism has been directly affected by weaker global economy on the one hand and the border disputes with Thailand on the other hand. The WB reported that a slowdown in tourist arrivals was noticeable in the first six months of 2008. As some do not hesitate to say that this economic depression may well be the worst in the world since the 1930s, one may wonder what a small country like Cambodia could do to respond to the crisis with its own resources. Vikram Nehru, the World Bank’s Chief Economist for East Asia and the Pacific, admitted frankly, from Tokyo, that “Cambodia was unlucky to [have been] caught in the crisis at this particular time”. Stéphane Guimbert, for his part, put forward four key policies which could help lessen the impact of the shock wave on Cambodia. To start with, he advocated the strong supervision of the banking sector to avoid financial risks. “The financial sector is still very young in Cambodia. If there is a problem, the situation could get worse very quickly!” he warned, adding that the government was on the right track in this field. He also suggested the establishment of fiscal stimulus meant to support growth without jeopardizing macroeconomic stability. In such a context, Cambodia seems bound to lose its market shares in the United States since demand will clearly be reduced. The Kingdom will then be forced to seek new markets, Vikram Nehru advised. Cambodia must boost its competitiveness - “it must be one of the country's priorities”, Stéphane Guimbert insisted – by facilitating trade, offering fiscal stimulus and dealing with labour-related conflicts. The World Bank economist reminded that the country suffered from its dollarised economy since the American dollar has been appreciating against other currencies circulating in the region due to the inflation this year. With bad luck comes ... some good? The World bank economists yet want to believe that there may be a few advantages to take from the current situation of crisis, at least in the medium term. In the case of Cambodia, the sector of agriculture, which is still far from being exploited in the best way, could be boosted more, with a view to support economic growth. “Although the price of rice has gone down after a peak in May-June, it is still higher than it was before. This allows farmers to invest more in their land and buy pumps for irrigation or more seeds and fertiliser to increase their crop yields and make more profit...”, Stéphane Guimbert suggested. Then, before the crisis actually vanishes and investors, currently sitting on their liquidities, come back to speculate, the latter will keep thinking twice before committing to any project, worried about the financial risks they would potentially take. To Stéphane Guimbert, it is time for Cambodia to do everything in its power to reduce these risks by improving the climate for investment. Moreover, Cambodia, according to the economist, must dare implementing “slightly more ambitious” expenditure policies, particularly when it comes to infrastructure projects and social protection nets, which will have a beneficial effect on potential growth in the medium term. The Cambodian government seems to be taking this track, judging by the 2009 budget, widely increased (US$1.8 billion) and adopted on Tuesday December 9th by the National Assembly. In order to slow down inflation and lessen financial sector risks, the Central Bank tightened its monetary policy, as pointed out in the World Bank report. With further details, the WB described that the Central Bank doubled reserve requirements in July 2008, introduced a ceiling on loans to the real estate sector, tripled capital requirements in September 2008 and introduced restrictions on cash withdrawals from the Central Bank in October 2008. The government continues to advance structural reforms, although with some slowdown at the time of the elections. Progress has also been made in upgrading the legal framework for investment, notably with the enactment of the Law on Secured Transactions, which makes it possible for a business to use its moveable and intangible assets as security for a loan. The World Bank pointed out that this had allowed Cambodia to skip 15 places in the 2009 “Doing Business” Report. Last but not least, the World Bank assessment quoted another important reform recently enacted, namely the introduction in May 2008 of ASYCUDA, or Automated System for Customs Data, at the Port of Sihanoukville.